The Military-Historical Festival "Karelian Borders. Medvezhegorsk"
The parade of war-historical festivals called "Karelian Borders" and dedicated to the 60th anniversary of the Great Victory is going on. It began in Suojärvi district in March, 2005. 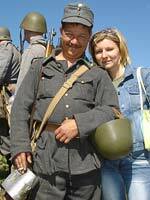 On the 19th of June, 2005 it has been continued in the town of Medvezhegorsk where there is an interesting historical object of the period of the Second World War – the complex of Finnish fortifications. After Medvezhegorsk had been captured by the Finns in December 1941, the Finnish Military Command faced a question of building a powerful fortification on this territory. By 1944 all the dominant heights the town was surrounded by from its three sides, had been turned into well-made fortifications. These were the complex constructions caved in the rocks and carefully masked. It turned out that the defensive potential in Medvezhegorsk was not practically used, the town was taken by the Soviet troops in June 1944. The remnants of fortifications have been preserved: a great number of trenches, dugouts, shelters and anti-tank obstacles. To see them those who wish can go to the excursions "The defensive line of Medvezhijegorsk". 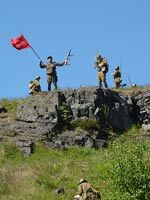 The traditional part of the festival- battle scenes` reconstruction- took place in the fortificated area of Medvezhijegorsk, on the Lysuha hill, to memorize the battles of June 1944. Different clubs of war-history amateurs from Petrozavodsk and St.-Petersburg prepared the show of taking the fortificated area by the Soviet troops. The fight was for the dugout where the Finnish soldiers held the line. 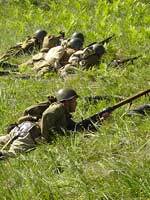 Finally the Soviet troops breached the enemy`s defences as it was in 1944. To proclaim the Soviet soldiers the winners the Soviet commander was swinging the flag to the spectators` crying "Hurrah". The honoured guests were the veterans of the Second World War. Unfortunately, there were a few of them. One of them was Richard Broneslavovich Yanussick who had taken part in the liberation of Medvezhegorsk in 1944. He arrived from Petrozavodsk to participate in the festival. Richard Yanussick hasn`t been there for 60 years and he followed the show with great interest. He noticed that such festivals were necessary for the patriotic education of the youth. Within the festival there was a patriotic action called " The dialogue of the generations". The participants of the action were the veterans of the Great Patriotic War, representatives of different social societies, of the Republican and local authorities, Mass Media, pupils and students. The topic for discussion was War. The veterans told their memories, the children of the Second World War were asked to speak, too – Ivan Alekseevich Kostin, the chief of the society "The Zaonezhije land", and Armas Mishin, a writer and a translator. Pupils told about their grandfathers and great-grandfathers, recited poems that they had written themselves. They used electronic presentations. The purpose of the festival was to make people be filled with proud for the Great Victory and come to peace. The festival was organized by the Republican Center for State Protection of Objects of Cultural Heritage with the assistance of the Ministry of Culture and public affair of the Republic of Karelia, the local authorities of Medvezhegorsk district and the Medvezhegorsk local museum.